The Mash Collective is Stone & Wood's side project that sees them unite their brewers with colourful, creative characters who call their part of the world home. 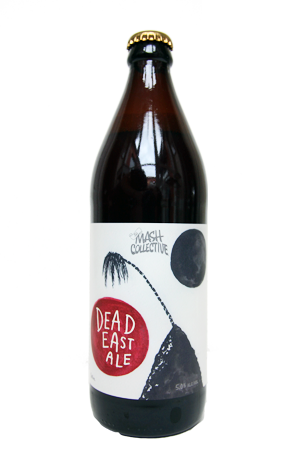 For the fifth release – following last year's epic Heartbreaker – the guest collaborators were artist Paul McNeil, surfer Asher Pacey and restaurateur Jeff Bennett, who sat down with the brewers in Byron Bay, worked their way through a broad range of beers, decided what they'd like to encapsulate their brew, and ended up with Dead East Ale. So titled for the "endless perfect days on the easternmost tip of Australia", the beer they came up with is a hoppy amber ale featuring three US hops: the well known Simcoe and Citra and new trial variety Crosby #6 out of Idaho. It's a trio that, in tandem with a blend of toasted malts, throws out broad tropical and berry hop aromas and adds distinctive blackcurrant and berry flavours, plus a lingering earthy bitterness, to soft caramel and biscuit malts. Not as out there as some past Mash Collective releases: just a smooth, balanced, fruity ale.